A lot of teams went through roster changes in Week Three of the NFL season. Players made their season debut, others suffered injuries that will leave them sidelined, and a controversial call has left many still talking. Similarly to Mayfield, Cardinals rookie Quarterback Josh Rosen made his debut this week. Unfortunately for Rosen, he entered the game in a much more difficult situation; the young QB was put in with four and a half minutes left in the game, trailing by just two points. Rosen moved the team down the field, but the drive ended with an interception and the Cardinals lost the game. Even though Rosen didn’t spend much time on the field, Coach Steve Wilks liked what he saw. As of Monday, Rosen will be the starter for the Arizona Cardinals. Another rookie quarterback shined on Sunday; Josh Allen of the Buffalo Bills led his team to victory in the most shocking upset so far this season. Allen finished the game with 196 yards, one touchdown pass, and two rushing scores. Allen’s efforts largely contributed to the Bills 27-6 win over the Minnesota Vikings. Monday brought bad news for the San Francisco 49ers. After an MRI on Monday, the team announced that their starting quarterback, Jimmy Garoppolo, had suffered a torn ACL and will be done for the year. 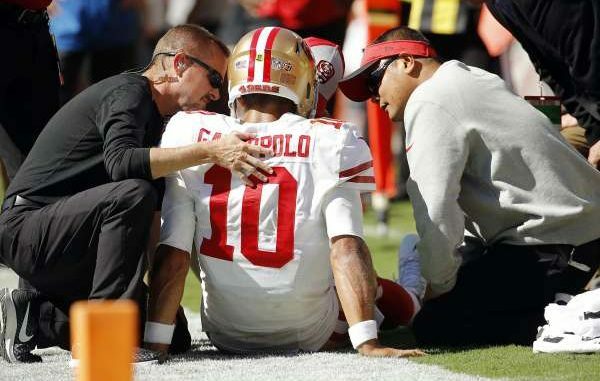 Garoppolo’s injury came on a scrambling play in the fourth quarter of the 49ers game against the Kansas City Chiefs. The 49ers ended up losing the game 38-27, as Chiefs Quarterback Patrick Mahomes continued to be impressive. Mahomes threw for three more touchdowns on Sunday, bringing his total up to 13, breaking Peyton Manning’s record for most passing scores in the first three games of a season. The Chiefs high powered offense is currently on pace for a record breaking 85 touchdowns this season. In other QB news, The Philadelphia Eagles are no longer without their franchise quarterback. Carson Wentz made his season debut against the Colts on Sunday, less than a year after tearing his ACL and LCL. Wentz had said that he wanted to start Week One, but the Eagles chose to be cautious. He led the team downfield for a touchdown on his first drive and helped guide the Eagles to a 20-16 win. The biggest controversy of the week came late in the third quarter of the Packers game against the Redskins. Packers Linebacker Clay Matthews was called for roughing the passer after he sacked Redskins Quarterback Alex Smith. The call came from Referee Craig Wrolstad, who deemed the hit illegal and penalized the Packers 15 yards. A new NFL rule states that a defender “is responsible for avoiding landing on the quarterback when taking him to the ground.” Wrolstad believed that Matthews landed on Smith with most of his body weight. Packers Head Coach Mike McCarthy also came to the Linebacker’s defense, but the NFL disagreed. The league’s Twitter account confirmed that the call was correct.